This trade mission signed Letters of Intents (LOI) demonstrating the intent of Taiwanese buyers to purchase 5.0 million tons (equivalent to 197 million bushels) of corn and 0.5 million tons of corn co-products (distiller's dried grains with solubles, DDGS) between 2018 and 2019, valued at about $1.05 billion. The Taiwan Ministry of Foreign Affairs (MOFA) organized a 25-member delegation for the Taiwan Agricultural Goodwill Mission that traveled to the United States in September 2017. As part of this effort, the U.S. Grains Council (USGC) used Market Access Program (MAP) funds to sponsor eight members of the delegation. In participating with the mission, these participants gained familiarity with the yield, production and quality of the 2017 U.S. corn crop and related corn products. The mission also provided face-to-face interactions between the group’s members and U.S. grain producers, key leaders of related producer associations, state and national elected officials and government representatives. This trade mission signed Letters of Intents (LOI) at the U.S. Capitol in Washington, D.C., on Sept. 13; at the State Capitol in Des Moines, Iowa, on Sept. 15; at the State House in Indianapolis, Indiana, on Sept. 18; and at the Missouri Department of Agriculture in Jefferson City, Missouri, on Sept. 21. 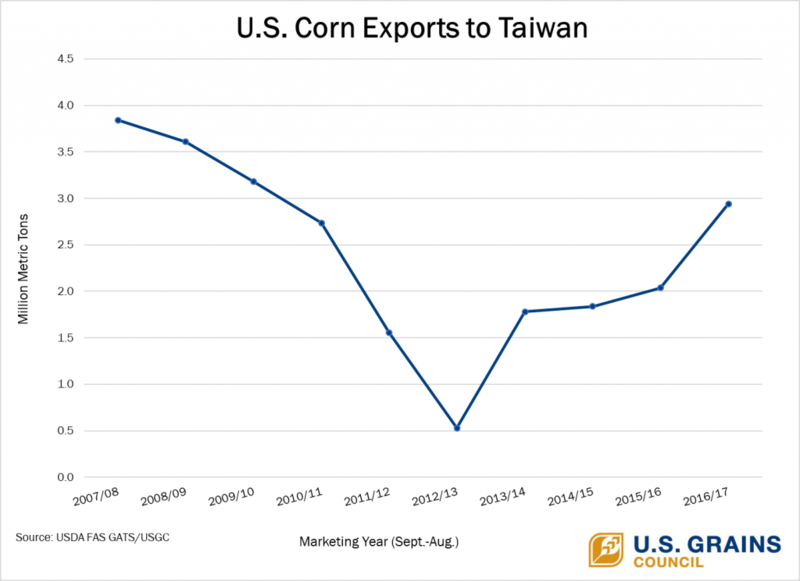 These LOI’s demonstrated the intent of Taiwanese buyers to purchase 5.0 million tons (equivalent to 197 million bushels) of corn and 0.5 million tons of corn co-products (distiller’s dried grains with solubles, DDGS) between 2018 and 2019, valued at about $1.05 billion. The total value for all commodities included in the mission (corn, DDGS, soybeans and wheat) is estimated at $2.73-$2.83 billion. 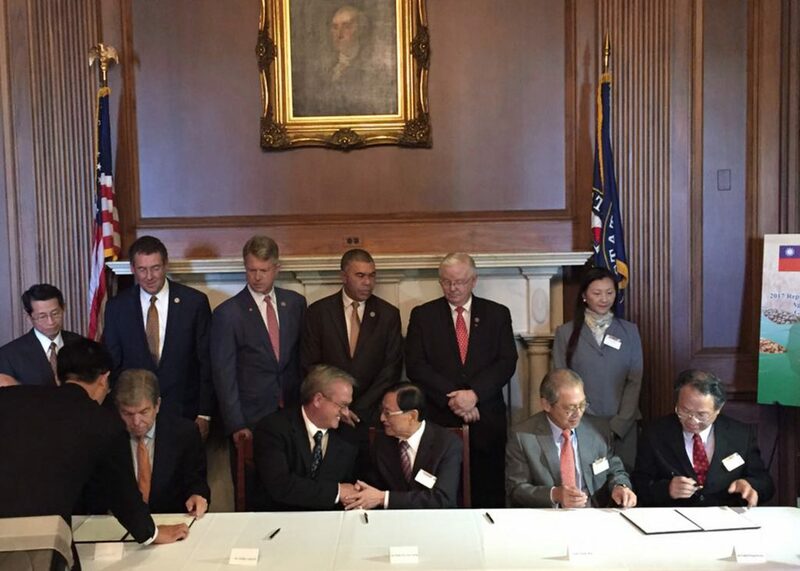 The LOI signing is part of a long-time partnership between the U.S. and Taiwan and also between the Council and related industries in Taiwan, a long-established and deeply valued customer and partner of U.S. grains. This trade mission helped members acquire updated market information on the production of U.S. corn, production and quality of DDGS and ethanol, the growth stages of corn, precision farming, applications of large agricultural machines and GPS technology, the U.S. grains transport system, the advantages of biotechnology, and the handling, transportation, grading and inspection system of U.S. grains. This mission provided the members confidence in the good quality of U.S. corn produced and the capability of the U.S. to supply exports. One member placed a trial order to POET in November 2017 for 100 metric tons of DDGS, one direct result of this trade mission. The Taiwan Ministry of Foreign Affairs (MOFA) initiated and organized this trade mission. However, the Council played a key role in helping arrange LOI signings, hosting participants and arranging the overall program. The Council invested $40,000 in this marketing program, generating a return on investment of $12,800 per $1 of MAP funds invested.